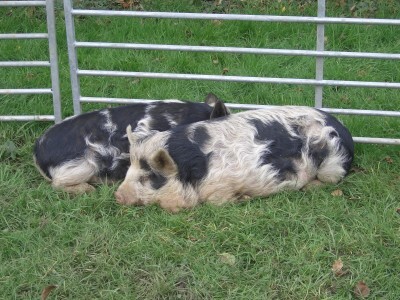 Faith, Hope and Charity are our female breeding Kune Kune Pigs. They are highly intelligent and come when they are called. They love vegetables and fruit. 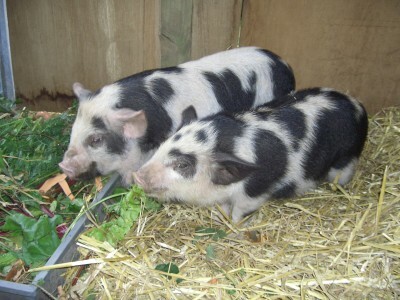 Kune Kune pigs are a small, grass-eating breed originating from New Zealand. 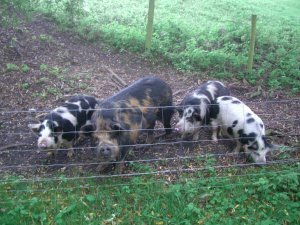 Kune Kune pigs can be trained - ours usually come to us when called, or the feed bucket is shaken. They are known for being calm. They love having their backs scratched and Hope will roll over, grunting with delight. They eat pig pellets as well as any fruit / vegetable scraps. We do not feed them eggs, meat or anything that has been near meat. They have a wood / straw shelter which they are free to wander in and out of. They also have free access to a grassy run and a wooded area. They have their very own wallow - a pond liner sheet filled with water. Hope unfortunately never fell pregnant, but Faith and Charity have regularly given us litters of up to 10 piglets. We plan for them to have 3 litters over the space of 24months, allowing them plenty of time to rest in between.